The North Carolina Aquarium at Roanoke Island helped 14 sea turtles reunite with the ocean Sunday. Nine of the released turtles were Kemp’s ridleys transferred to the aquarium’s Sea Turtle Assistance and Rehabilitation Center, known as the STAR Center, to recover from cold-stunning in New England, the aquarium said in an Instagram post. 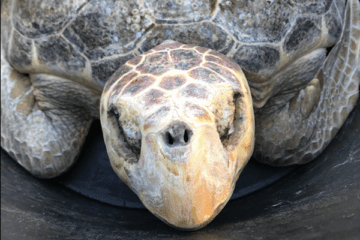 Three were yearling loggerheads that were educational animal ambassadors at the N.C. aquariums, along with a green sea turtle and a loggerhead that were rehabilitated at the STAR Center. The turtles were taken north to Virginia Beach, where they hitched a ride out to warmer waters — 70 degrees, to be exact — with the crew of the U.S. Coast Guard Cutter Heron. “Thanks to the Coast Guard and all of our partners, including the Network for Endangered Sea Turtles and North Carolina Wildlife Resources Commission for getting everything lined up for this successful release!” the aquarium posted.